From the José Carreras Foundation against leukaemia we have invested over 2.5 million euros in the construction of facilities and laboratories of this new science campus located in the Faculty of Medicine of the University of Barcelona, ​​and we have provided it with the most advanced research equipment. The projects taking place at the Clínic-UB Campus, of the Josep Carreras Leukaemia Research Institute, CERCA centre of the Catalan government, are designed for basic, translational and clinical research in the field of haematological malignancies. 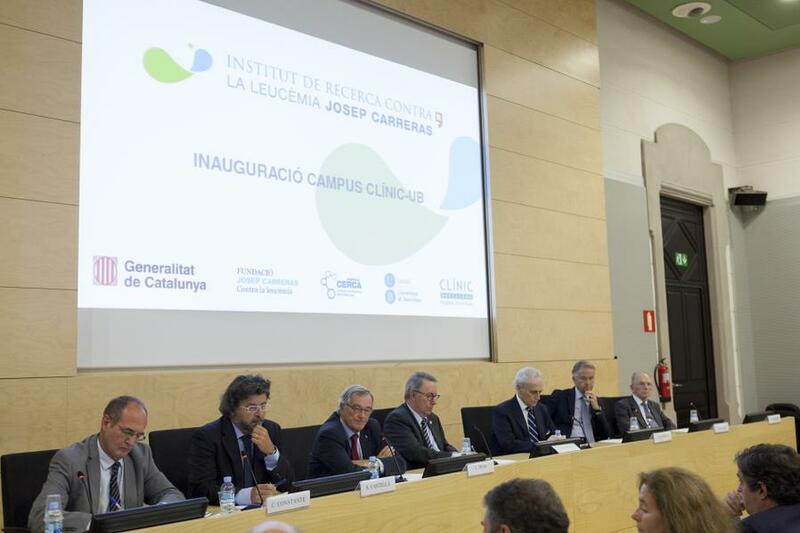 The Aula Magna of the Faculty of Medicine of the University of Barcelona hosted the opening ceremony of the laboratories and facilities of the Clinic-UB Campus of the Josep Carreras Leukaemia Research Institute, created in 2010 by the José Carreras Foundation against Leukaemia and the Catalan Government with the aim of achieving that leukaemia becomes, one day, 100% curable. Mr. Xavier Trias, mayor of Barcelona, Mr. Antoni Castellà, Secretary General of Universities and Research of the Catalan Government; Dr. Carles Constante, Director of Planning and Health Research of the Catalan Government; Dr. Dídac Ramírez, Rector of the University of Barcelona (UB) and Mr. Josep Carreras, president of the José Carreras Leukaemia Foundation and the Josep Carreras Leukaemia Research Institute Foundation (IJC) have lead the ceremony visiting the new laboratories, scientifically led by Dr. Pablo Menéndez and coordinated by Dr. Alvaro Urbano-Ispizua. Other responsible doctors, scientists and teachers have also participated in this inaugural event which means increasing existing scientific references in the field of study of leukaemia and other haematological malignancies, diseases that affect thousands of people every year in Spain. Among them we highlight the presence of Profs. Ciril Rozman and Evarist Feliu and Dr. Enric Carreras, leading experts in haematology, Hospital Clínic members and of the José Carreras Foundation; Prof. Francesc Cardellach, Dean of the UB; Dr. Josep M ª Piqué, General Director of the Hospital Clínic, Dr. Josep M ª Campistol, Medical Director of the Hospital Clinic and Dr. Lluís Rovira, Director of centres CERCA of the Catalan government. The Clinic-UB Campus of the Josep Carreras Leukaemia Research Institute has a 250m² floor at the Faculty of Medicine. Among other facilities, the IJC has provided the Clinic-UB Campus of a molecular lab, a Laboratory of Flow Cytometry, a Cryobiology room and contributed to the development of the animal facility, ensuring its construction, valued at € 870,000, with scientific equipment, valued at € 1,690,000. Similarly, due to the complexity of some processes, the IJC has remodelled some shared facilities of the UB in the areas of microscopy, proteomics and genomics to ensure their optimal use. The activity of first importance of the Josep Carreras Leukaemia Research Institute at these headquarters located in UB, is focused on the development of basic, translational and clinical research projects in the field of study of the (normal and leukemic) haematopoietic stem cells, and cell therapy, which corresponds to two lines of current research priority of the IJC. Research in hematopoietic progenitors and cell therapy, is performed in the framework of Cell Therapy UB (TCUB) coordinated by the Faculty of Medicine, which includes preclinical and clinical research teams of various medical specialties. Also, different projects are being developed on clinical and translational research in certain diseases such as acute myeloblastic leukaemia, myelodysplastic syndromes, and multiple myeloma. The Research Director of the Clinic-UB Campus is Dr. Pablo Menéndez, ICREA researcher (Catalan Government). Leukaemia Stem Cell Group. Study of the leukaemia stem cell. Stem cells, mesenchymal cancer and development. Study of human pluripotent and multipotent stem cells. Stem Cell Transplantation. Cell therapy for the prevention and treatment of major complications of hematopoietic transplantation. Barcelona Endothelium Team (BET). Study of the role of endothelial dysfunction in various diseases and complications due to transplants. Acute myeloblastic leukaemia. Study of the molecular prognostic factors and new therapeutic targets for the treatment of AML. Monoclonal gammopathies. Study of predictive factors and clinical trials phase I, II and III for the treatment of multiple myeloma with new molecules. 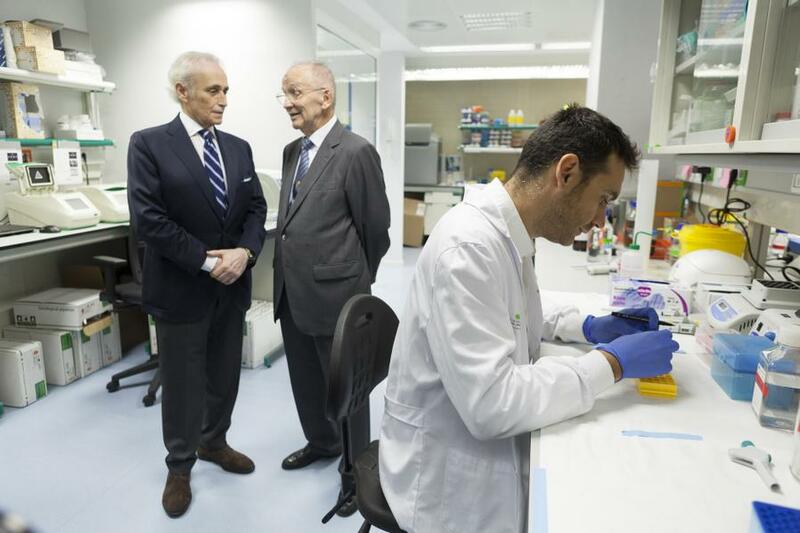 More information about the Josep Carreras Leukaemia Research Institute.